It's been a while, but I'm still going. been working on a lot of stuff, one being an entity editor for the map editor. 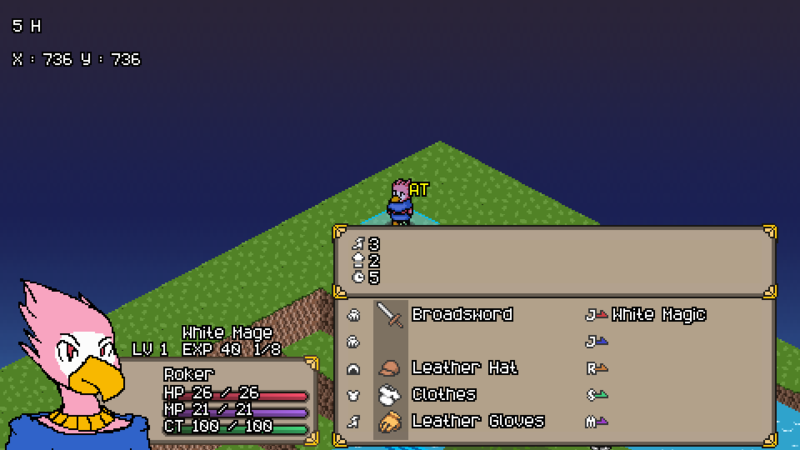 at the moment it only allows generation of a random unit, but will be able to edit the finer details afterwards. I've also been working on the status screen during battle. Plans for the event editor are in the works and i hope to start on it after the entity editor. Actually FFMaster already has a hack that should edit Reis abilities. Last one in the "other hacks" section. Unless I'm misunderstanding the hack, can't say I've tested it either. Ah I searched for a while but didnt come across that. Thanks. Works great. Why not just 0% hit if not monster? That sounds like it would be a simple formula hack to make... in your case it sounds like you want more of a flag though. That would be way harder to implement. 0% if not a monster would work well I think actually. Was more looking for a formula hack of some kind. I was wondering if anyone has made an ASM to make selected abilities monster-targetable only? No associated portraits for the jobs but multiple jobs and races in a battle. It's been a while. I've been busy with stuff in my personal life, it got in the way of development. So here's a nice dev update, long overdue. I've been working on multiple races and classes, implementing them slowly into the game. One of the new races is featured in these gifs. They're sort of like Kobolds. There are more races to come however, so stay tuned. Palette swapped sprites have also been added. They work similarly to FFT where they use a predefined palette of 8 colors for the sprite and 5 additional colors for the portrait. So I can get something like this in-game. The formation screen was started on today, with great results. It also showcases different class sprites in play. A Blue Mage actually sounds like a good replacement for Calculator, and definitely sounds like a fun challenge to create and make work with the rest of the jobs. Suppose the requirements for said job would revolve around either Black Mage or Summoner, and perhaps Mediator (because of Monster Talk?). For the Bard and Dancer, sure others may like the design choice, but I suppose that's why I've presented an alternative to see if other people would like it over the original. Perhaps there's a middle ground that could be met, because I wanted to look at buffing Bard / Dancer. Let me know if there would be any other way to change them to feel more.. dynamic? I guess? Archer I've seen been transformed into debuffers and I personally like them that way over the Charge set. FFTA and FFTA2 utilized that class much better than FFT, so I would definitely be up to making them use similar abilities. Squire is a tough one because it's generally looked at as the starting class alongside Chemist, but I get what you mean. This is fair. I understand that it wouldn't be the best idea to single out certain jobs with the idea of 'balancing'. This is mostly just a brainstorming topic that could potentially become more? Testing different ways to change certain classes to be more viable or more entertaining is something I think would be cool to try. And yeah, the game is mostly "whom ever can dish out the most damage in the least amount of time would win" and that's probably it's weakest point in it's genre of tactical rpg games (even though I love it to pieces and think it's the best in it's genre). And of course, everyone has different personal ideals of what a class should play like. I can understand that maybe the devs intentionally wanted the Bard / Dancer classes to play their roles in the corners of the maps with their moves on repeat, but in my opinion I feel like it was a poor design choice and could have been designed a bit better. (I'm no professional game designer though so my opinion is not worth much I suppose). While I get that changing them in this way would make them play similar to another mage class, I feel that with the right changes it could be still it's own unique class and play more dynamically with the team instead of sitting in said corner. I understand that ideally, it'd be impossible to balance every class to make them all equally favorable. A lot of classes are one-trick ponies or just gimmicky. This one I think would be the hardest to "balance" without just outright replacing the class altogether. Todo. I feel like the Bard class is the outright weakest class in the game. The buffs are hit and miss, sitting in a corner is no fun really, and pretty weak stats. Here are some changes I think could make the class more enjoyable. Needs testing : Change formulas for hit chance for song buffs. I feel like this would make Bard a more dynamic and fun class. You can't just stick him in a corner anymore. He needs to travel with his party. Dancer is a bit more powerful than Bard, as debuffs do a lot more to the enemy than buffs would to your party, as well as having a larger set of equipment to utilize (knives and cloth, whereas Bards only get Harps), but still mostly underutilized. Needs testing : Change formulas for hit chance for dance debuffs. Same with Bard, I feel like this would make Dancer a more dynamic class and fun class. Can't just sit in a corner anymore. I want to know your thoughts and possible ideas that could go with this. What jobs do you think are overpowered / underpowered and what do you think could be done to balance them. I'll be adding more myself when I get around to testing out different ways to balance some classes. Thanks guys! If you have any questions or future suggestions let me know. Now the real battling begins. Also camera lerping can do wonders. https://xnblank.itch.io/prototactics if anyone wants to play around with the engine in it's current state, here you go. Thanks HowDo. Maps aren't saved as a 2D array, but more that each tile and entity's properties are written to a binary buffer and exported to a file. Also the tile shifting is an issue with the camera renderer. The game is rendered at 320x180 and then upscaled to 640x360, but I haven't upscaled the rendered, only the window, so everything looks choppy because pixels are trying to be between pixels. Battles on custom maps now work! Had to rework the save / load in my map editor because when compiled, the original didn't work. 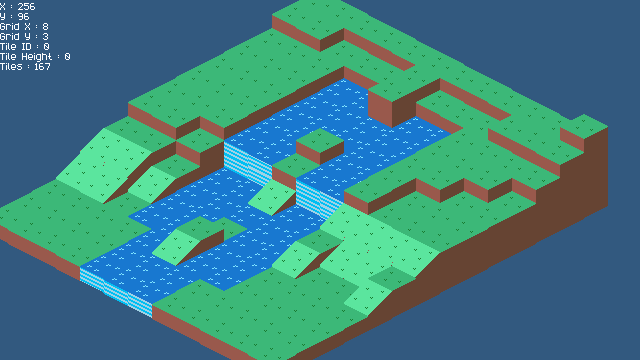 I've started working on a built in map-editor to make the production process a lot quicker and easier for myself. Here's a map I threw together in about 2 minutes. Thanks. I'm quite happy with myself that I've exceeded what I had done previously in just 2 days. Hey folks. It's been a long time, and you're probably thinking, why is he posting in his own dead topic that hasn't shown any sign of an update in over 2 years? Well, I wanted to share a bit of info. When I started this project, I was an overly ambitious teenager. I was technically jumping into something super advanced with no knowledge of what I was actually doing. The project was later scrapped and lost. But then, 2 days ago, I decided I would try again, and I would like to share some progress screenshots. I decided to base it around how FFTA worked, with it's simpler sprite work and restricted camera. I started with grid movement and height. Then I started adding tiles. Then came the basic UI elements. Then I made some FFTA-styled robot characters. I thought my little soldiers would like to move around a bit. And finally, I've started work on some AI. There's a lot to do in this category. So to summarize, even though I had abandoned the original project, I didn't give up my initial dream and restarted when I felt ready. I feel like I learned quite a bit over the past 2 years. What do you think of all of this? I'd love to hear your opinions. Made my friend a character for him. For the sprite I took the male Archer head and changed it, and plopped it onto the male Squire body. The portrait is an edit of the Gariland Squire. I honestly tried my best with it.